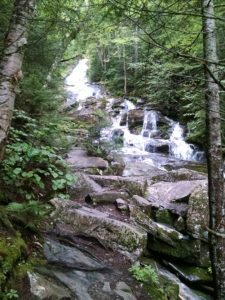 For my entire NoBo hike, I’ve been looking forward to the White Mountains, especially after hearing things like the quotation above while prepping for my thru. Starting just inside New Hampshire, and running for about a hundred miles, the Whites are known for being wild, rocky, challenging, unpredictable, and gorgeous. The climbs are steeper and longer, the views more breathtaking, and the weather more dangerous than anything since the Smokies, almost 1500 miles south. I admit, I’ve been a little nervous, but I’ve hiked 1800 miles to get here and I think I should be able to handle it. Today, I got to experience my first big White Mountain climb. I stayed last night at Hikers Welcome hostel in Warren, NH, and since the package with all of my winter clothing was supposed to arrive today, rather than waiting for the mail all day, I decided to Southbound Mt. Moosilauke, getting dropped off on the north side of the mountain and hiking up and over to return to the hostel, collect my winter gear, and spend one more night before continuing through. Climbin’ up along a waterfall. The climb up the north side was spectacular. It was cloudy and breezy and cool, and it rained last night, so the waterfall alongside the climb was gorgeous but the rocks of the trail had mostly dried and weren’t too slippery. 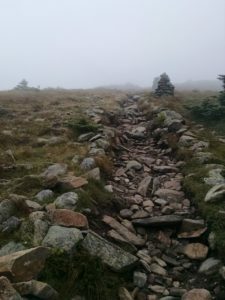 The trail was challenging but also just plain fun – for most of the way up, I kept my trekking poles in one hand and scrambled upward, grabbing roots, rocks, trees, and sometimes rebar drilled into the side of the mountain to haul myself up. It was like a giant jungle gym and I loved it. One of the benefits of a SoBo hike was seeing all my friends throughout the day as they hiked north. I ran into Sage first and asked him how the summit was. “Exhilarating!” he said. “It’s wild. You’re gonna love it.” Next I saw Sunshine. She looked a little dazed and suggested I put on more winter gear before leaving tree line. “All my winter gear is arriving today. This is all I have for now,” I said, gesturing to my shorts and t-shirt, covered by my unzipped winter jacket. “Oh,” she said. “Well, move fast. You’re not going to want to hang out up there.” I thought she was exaggerating. Sure, I might be a little chilly, but how bad could it be? I emerged from tree line at exactly 12pm and was immediately buffeted by wind coming from my right, constantly pushing me to the left side of the trial and making me stumble over all the rocks. It got stronger and stronger; I’d never experienced anything like this in my life, and I’ve climbed up to 14,000 feet out west. It was like walking through a cloud. Visibility was maybe 150 feet. I could actually see the mist whipping along the ground, moving incredibly fast. Even though it wasn’t raining, I was soon soaked, with water dripping off my hood and my hair sticking wetly to my face when it wasn’t being whipped around. The wind picked up and I actually gasped. At several points, I had to pause for a minute and anchor myself to the ground with my trekking poles, waiting until a lull to be able to pick up my feet and move them without falling over. I ran into Mosey at the summit sign – luckily I saw him walking up from the south, otherwise I may not have been able to find the trail leading off in the fog. We took each others’ summit photos quickly and I immediately started south, starting to feel that it was urgent that I get back below tree line. 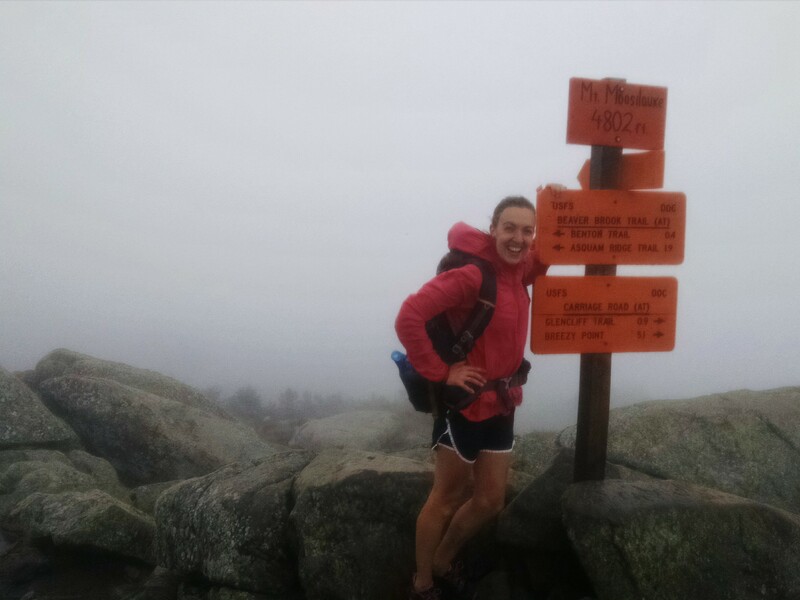 I was starting to lose feeling in my bare legs, my soaked feet, and my exposed hands. I passed Dutchess and Hatmandu. “Holy crap!” I yelled to them over the wind. “Double holy crap!” Dutchess yelled back, and then was literally blown off her feet by the wind. I helped her up and carried on. When I passed Stormcrow, he tried to fist-bump me, but I couldn’t get my fingers to form into a fist, and then I couldn’t quite line my hand up with his. I felt like I just had to keep moving to get out of the wind and keep my blood moving. Summit picture at 4,802 feet, trying not to be blown over. Just around 1pm, I made it back into the trees, although the wind was still whipping through and I was still freezing. I just wanted to keep climbing down, both to get more cover and to keep moving to stay warm. 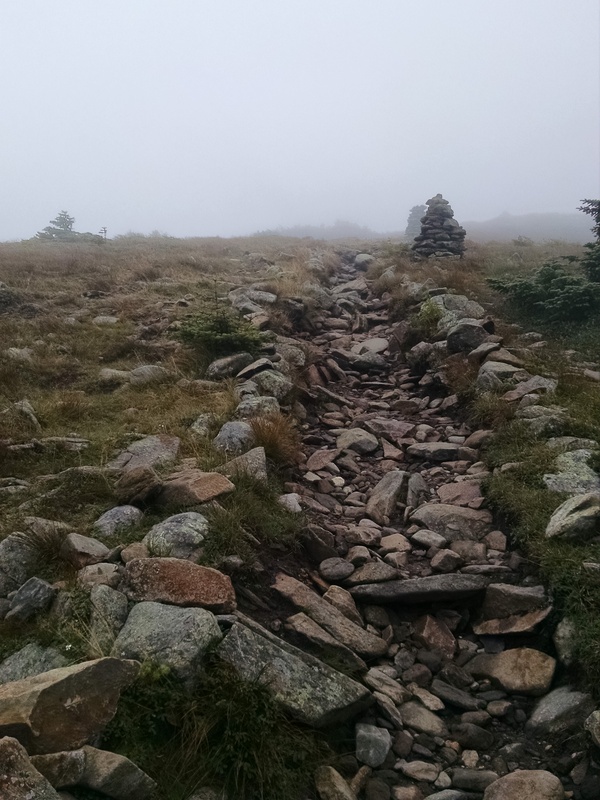 The south side of the mountain was much wetter and slicker, and I slipped down one rock face, catching myself with my hands behind me and landing partially on my pack. Slowly the wind got quieter and I got warmer, and the sun even came out after another hour of descent. I got back to the hostel about 5 hours after I had started, covering 9.3 miles, climbing 2932 feet and descending 3759 feet. I definitely have a healthy respect for the mountains coming up. This was just my first taste of the Whites, and it was awesome and scary and exhilarating and exciting. Thank goodness, when I got back to the hostel, my box of winter gear had arrived. I’ve kept my puffy jacket with me the whole hike but received back other pieces I’d sent home a little at a time: my long sleeve shirt, my zip-up fleece, windbreaker pants, and my knit hat. They would have been great to have today on Moosilauke, but at least I know I’m prepared for what’s coming! See more photos from along my hike and keep up with what’s coming on Instagram: @nicholeyoung1. Thanks!